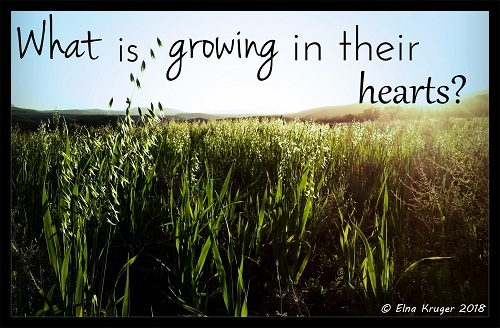 TO THE POINT: What is growing in their hearts? What is growing in their hearts? In South Africa the past three months was the start of a new school year. The first quarter was therefore an exciting one, as you start off with new books, curriculum, activities, sports and such. The first quarter is the first indicator for whether your vision and plans are realistic. Within only a few weeks you will have a feeling what works for your specific child and situation now, and what doesn’t work. On a practical level, the main objective of the first quarter is to sort out the homeschool and other activities’ routine, including content and curriculum as you DO what you have planned. A good homeschooling-start in the first quarter sets the pace for the rest of the year. After a few weeks of school and especially during the second quarter (which is now), it is time to clarify the plans you have made in terms of a realistic work volume, a realistic schedule (which allows for enough productive free time), and realistic expectations of what your child can achieve. Remember that as homeschoolers we do not need to just continue doing things that does not make sense...we can Adapt/Change whatever is not working for the next quarter. This is especially important as we SEE what is happening over time. In terms of looking with a parent’s eyes, now is the time that you will also see what is growing in your children heart’s and character and what not? · Rescheduling your week’s regular visits, socials and interactions just to leave some margin in your life, this may include sports and out of home activities. Remember that homeschooling is a long-term process (like farming) – it is your privilege to experiment in what works and what doesn’t but it does take time, sometimes extra time. · Are they motivated to read, learn and do? · Are they reading? Learning and doing stuff resulting in quality education? · Are they happy? Healthy - physically, emotionally and spiritually? · Or are they bored? Why are they bored and with what exactly? · Are their character growing in perseverance, patience and kindness? · Are they frustrated or challenged intellectually with the work being done ? Is it too difficult or too easy? · Are you satisfied with how things are going? Why or why not ? What should you do to change and adapt to improve the next quarter? If you are feeling especially discouraged because you are not seeing the results you thought you would by now, read Joshua 1:5-9 and see how the Lord is telling Joshua 3 times to BE STRONG AND VERY COURAGEOUS, as He promises to be with Joshua wherever he goes. Let it be a reminder that you are not alone, and God will guide you in decisions as you ask Him for wisdom and direction.